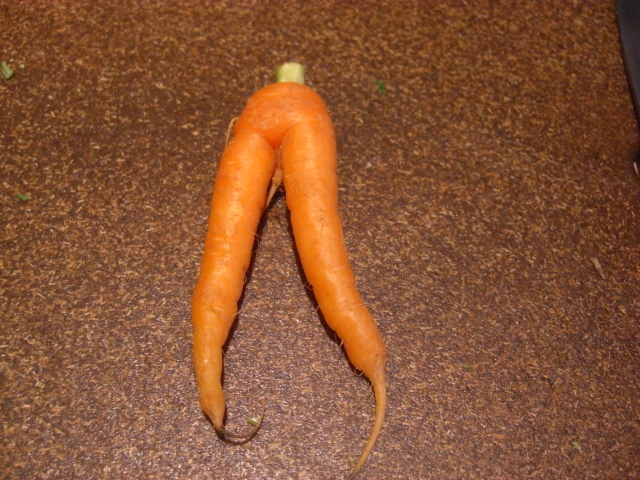 Check out this carrot – isn’t he strange? Yes, he is a he. No, I won’t turn him over to prove it. The dried mushrooms are awesome! When you reconstitute them (by soaking them in hot water for five minutes or so), you not only get mushrooms but also mushroom stock. 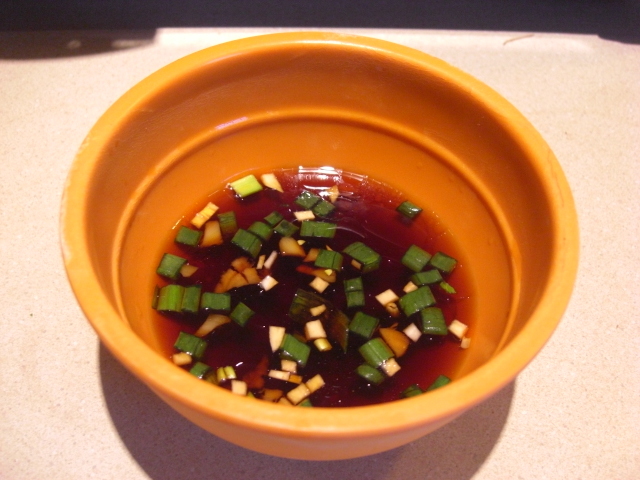 I used a cup of that stock as the majority of the liquid for the batter and made up the rest with soy sauce and water. The batter is better thin – more crepey, less pancakey. It should quickly drip off a spoon rather than fall in clumps. 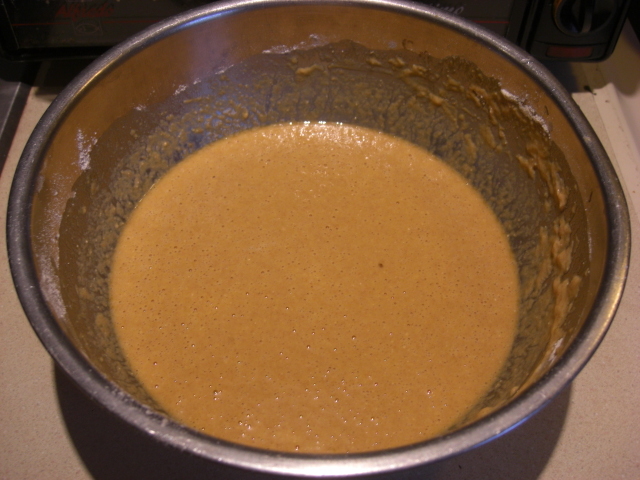 This batter is 4 little eggs, about 1-1/4 cup liquid, and about 1-3/4 cups pancake mix. 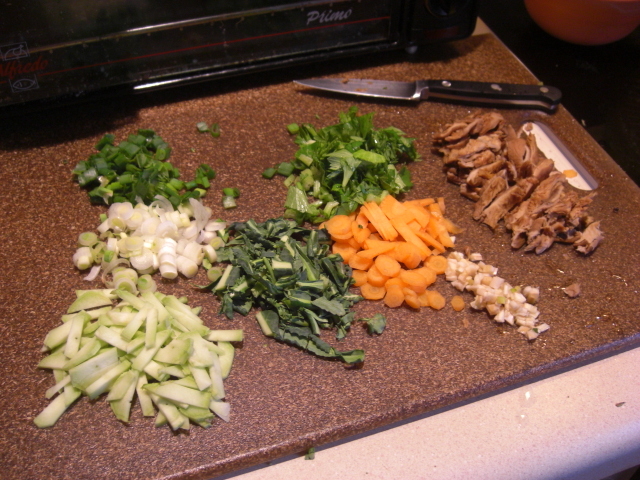 The other half-cup of stock, I reserved in a bowl and then added soy sauce, sesame oil, rice vinegar, garlic, ginger, and scallions. All pancakes need syrup, right? Yummy! 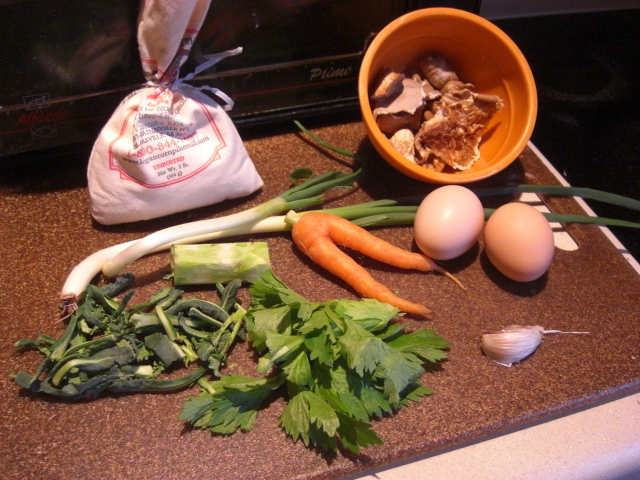 Mushroom stock has terrific flavor, and I look forward to using it in lo mein and in other non-Asian casseroles! 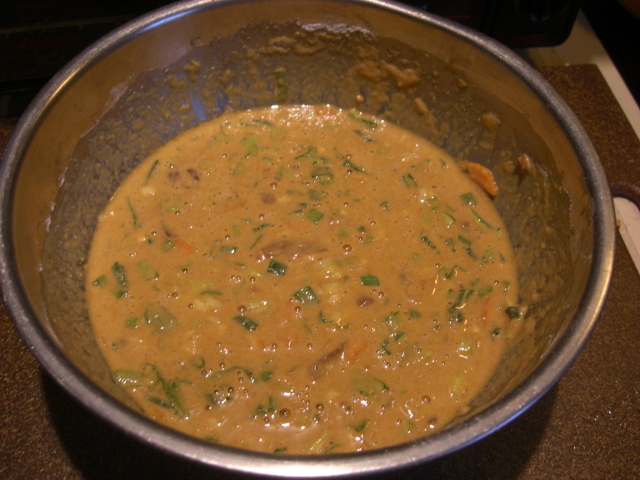 Here’s the batter with the vegetables added in. 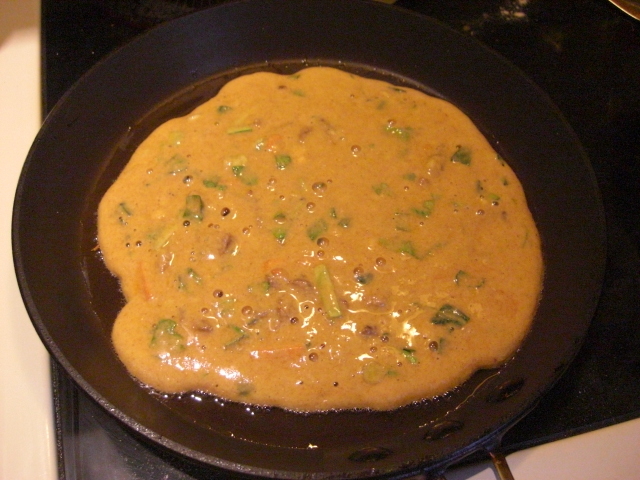 I poured roughly 3/4 cup of batter onto a skillet preheated to medium with a teaspoon of peanut oil. This batter is too thick because it doesn’t run to the edges! Flip after four or five minutes. Wipe out the skillet and repeat. That’s marinated coleslaw, not kimchi. I’m not that cool. 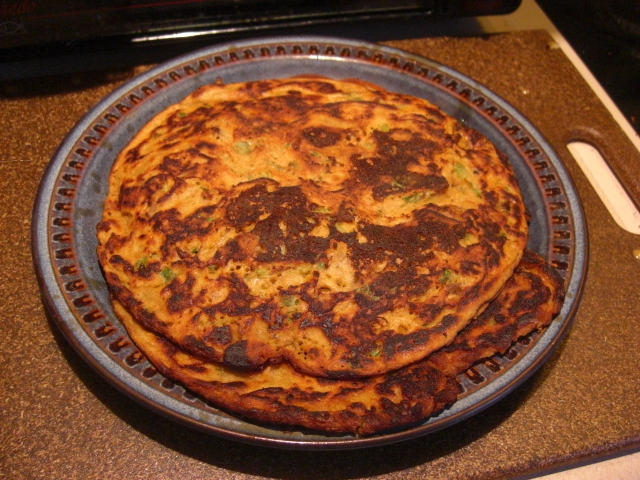 Nor am I cool enough to think to drizzle sauce and sprinkle scallions on the pancakes before taking a picture. Sigh. Patiently wait until the pan is hot and stably so. You don’t want the temperature increasing as you go. Use a teaspoon of oil (for non-stick) and wipe out the pan between pancakes. Don’t fall for the idea of making one last really big pancake. A thick cake will burn on the outside before it’s done on the inside. Make two small pancakes instead. Which is hard because you have to stand there and make them both. Tough. No one wants to eat a intriguingly burnt, yet impishly underdone pancake. However, I intend to use these lessons for blueberry pancakes more than veggie ones. I’m really glad I tried the dish, and the pancakes were delicious. Still, I prefer lo mein because pasta beats pancakes any day of the week. 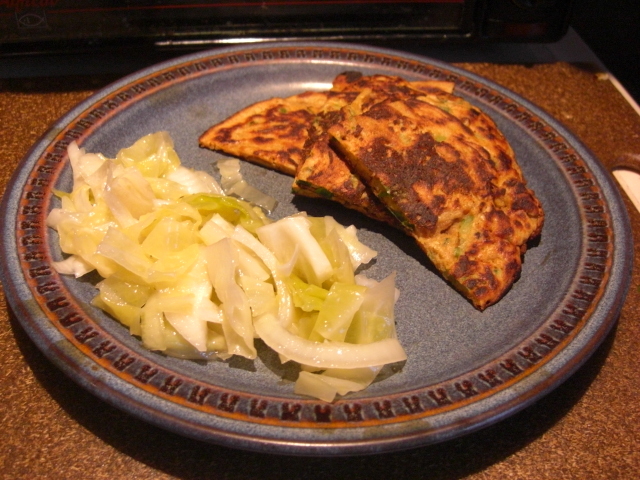 But the dish works great – especially if you can prep it and talk someone else into making the pancakes! Yay! Looks great! I started salivating over the mushroom stock “sauce.” I’ll see if I can get the recipe from my friend for the way she makes her pancake batter. I meant to say “syrup” not “sauce.” Too late for me, I guess LOL!